For over 50 years, the International Maize and Wheat Improvement Center (CIMMYT), lead center of the CGIAR Research program on Maize (MAIZE), has led the research and development of quality, improved maize seed, designed to help farmers mitigate the effects of climate change while improving livelihoods. Every new variety released is driven by farmer needs and preferences, with desirable traits such as pest and disease resistance, drought and heat tolerance as well as water and nutrient use efficiency. With improved maize seed, farmers not only benefit from increased stress tolerance, they also enjoy higher yields, increased nutritional value and improved income from grain sales. 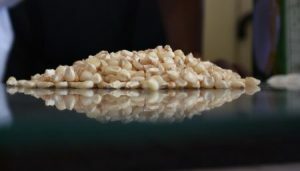 To ensure that quality seed standards are maintained, CIMMYT supports partners such as national agricultural research institutions and seed producers in acquisition and production of pure early generation seed, which is then tested by national quality assurance and certification agencies before certification and release. Seed certification is a rigorous process of testing new maize varieties before they are made available to farmers and follows an often lengthy three-step process. The first step – value for cultivation and use, or national performance trials in some countries, – compares traits of the new variety to others already in the market to determine its value. For a new variety to enter the market it must have significant value to the farmer, such as higher tolerance to stress, or added nutritional value. It is at the end of this valuation process that a variety is registered, which takes about 2-3 years. Next, a distinctiveness, uniformity and stability test (DUS) is performed on the seed sample provided to ensure that it is unique, uniform and will not deteriorate over time after its release. The DUS also helps to determine if an identical variety already exists and is registered, in order to avoid conflict among companies that are responsible for variety commercialization. The characteristics used to compare these materials are developed by breeders, and help distinguish different varieties. The length of time for DUS test varies by country, but on average the minimum is two planting seasons, about two years in most countries, or one year in others. Finally, the government approves the variety for release and commercialization. In some countries, such as Tanzania, there is an extra classification of seed know as quality declared seed which is certified seed that has been through fewer steps of certification. It is perceived to be of a lower quality than regular certified seeds, and is therefore cheaper. Seed certification protects farmers from unscrupulous traders who would otherwise sell poor quality seed or grain packaged as seed. Seed certification and commercialization can take 6-11 years, depending on how efficient a country’s system is. This lengthy and costly process can sometimes create backlogs, slowing release and commercialization of new varieties. This can discourage some seed companies from producing improved varieties, thus sticking to tried, tested and profitable varieties no matter how old they are. Commercializing a new variety is a huge investment in terms of cost, expertise, promotion and labor, so the longer certification process draws out, the more costs a company incurs. Farmers in turn continue to purchase the varieties that are always available, keeping them in demand. Expecting seed companies to replace an old variety for an improved one is somewhat complicated, since this is a purely business decision where profits are priority. In some cases, dropping a popular variety to promote a new one could jeopardize a company’s market share, brand recognition and potentially put them out of business. This is why old varieties like Matuba in Mozambique, SC513 in Zimbabwe and H614 D in Kenya remain popular, despite being decades old. Older seed dominating the market causes both farmers and seed companies to miss out on potential benefits and profits higher-performing seed can bring. Several strategies to retire old maize varieties and build demand for improved ones can be used, including demonstrating old and new varieties side by side in areas where target markets exist. This way, farmers themselves drive the process and start the switch to new varieties. Seed producers can emphasize a specific characteristic in the variety that will benefit the farmer. For instance, farmers in an area prone to maize lethal necrosis (MLN) are more likely to adopt a resistant variety, and eventually make a permanent switch once this characteristic is proven to be true. Government policies can also encourage the retirement of old varieties, for instance through subsidies on seed production with requirements to only include new materials. CIMMYT, through its various projects, gives competitive financial grants only to companies that produce improved maize seed. An extreme and potentially detrimental option would be to cut off funding and other support to seed companies that refuse to phase out old varieties. The Drought Tolerant Maize for Africa Seed Scaling (DTMASS) project works in six countries in eastern and southern Africa to produce and deploy affordable drought tolerant, stress resilient, and high-yielding maize varieties for smallholder farmers. DTMASS employs innovative and impactful strategies to promote uptake and adoption of these improved seed varieties, as well as sharing agronomy and other agricultural information directly with farmers to improve crop management. Led by CIMMYT and funded by the United States Agency for International Development, DTMASS is implemented through strategic partnerships with national agricultural research systems, as well as public and private seed producers.